No, it’s not Luciano Pavarotti singing When the Saints Go Marching In; it’s the 22-year-old Dragons second rower Luciano Leilua. The younger brother of 27-year-old Canberra centre Joey Leilua, Luciano, at 186 centimetres tall and weighing 116 kilograms, possesses good speed, a passing game and a great football mind, and he could have a breakout year in 2019. Locked in a tussle with Tariq Sims for the starting left-edge back row spot, he’s been mostly forced to bide his time on the bench in 2018. Tariq Sims had a fantastic year for the Dragons in 2018, capped off with a three-try haul against the Brisbane Broncos in an elimination final, and is unlikely to be dislodged from his starting position in the second row. Tyson Frizell likewise has a mortgage on a second-row spot, but with a legal cloud hanging over Dragons lock Jack de Belin 2019, this could be Luciano’s year. With Gareth Widdop, Corey Norman and Ben Hunt the main playmakers for the Dragons, Luciano could be a rampaging second-row playmaker out wide in the Dragons attack this season, linking with wingers or with an inside ball to centres or halves. Luciano has the weight and the ability to deliver offloads to supporting players as well as break the line. With increasing game time, he’ll have the support players running on to those offloads. Jacob Host, Korbin Sims, Josh Kerr, Jeremy Latimore and Blake Lawrie will provide plenty of competition for the forward spots in the Dragons Squad. But none have the size, speed or skills possessed by Luciano. A host of other 22-year-old Dragons forwards are in the mix with Luciano. Host had a quiet 2018 because of injuries, but at 190 centimetres tall and weighing 107 kilograms, he possesses both attack and defence in equal measure. 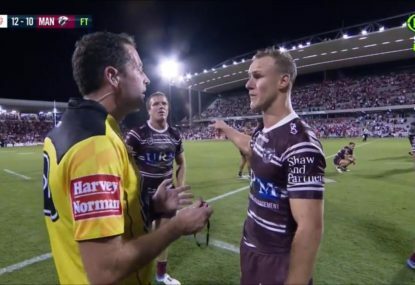 Blake Lawrie, at 185 centimetres and 106 kilograms, showed great promise in the front row in 2018, while Josh Kerr, at 197 centimetres and 112 kilograms, did not have an NRL start. 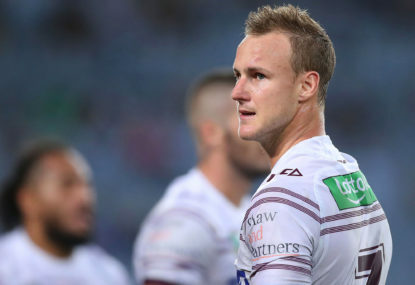 Front row forward Lachlan Timm (186 centimetres and 111kilograms) has joined the Dragons in 2019 with NRL in his sights. The experienced Korbin Sims (189 centimetres and 108kilograms) joins the Dragons from the Broncos to play alongside his brother Tariq. Established players Paul Vaughan. 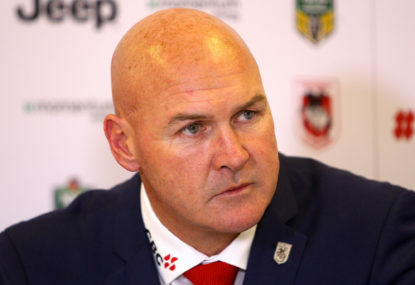 Cameron McInnes, James Graham, Tyson Frizell, Tariq Sims and Jack de Belin will no doubt lead the Dragons onto the field in Round 1, but if coach Paul McGregor looks their way, the 22-year-old Dragons young guns will keep them honest. 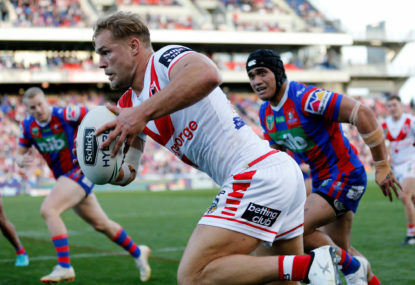 The Dragons play two big forward packs in the Knights and Rabittohs in trial matches, so they should have a good chance to test their forward strength. The Dragons halves will also line up against the experimental but exceptional Knights halves pairing of Kalyn Ponga and Mitchell Pearce and experienced Rabittohs Adam Reynolds and Cody Walker.